Celebrating acid has become a tradition here at the Kozzmozz HQ. 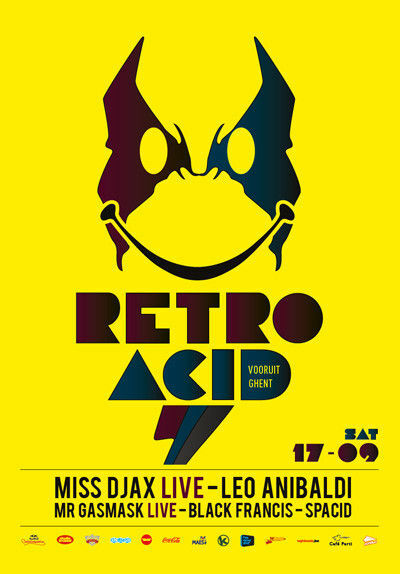 The first edition of Retro Acid was held back in 1997 and our second oldest event is still going as strong as ever. Retro Acid is about showing you all the shades of acid, from the early 80’s acid house to the harder 90’s sounds. Over the years we invited a wide range of artists such as Acid Junkies, Damon Wild, Mike Dredd, DJ Pierre, A Guy Called Gerald, Phuture 303, Dr. Motte, Tyree Cooper, Oliver Bondzio, Like A Tim, Brixton, Random XS, Richard Bartz, Woody Mc Bride and many others. Acid will forever be linked to the legendary Roland TB-303 bass machine that simply took electronic music by a storm and revolutionized it, spawning a radically new sound. Acid left its mark on electronic music like no other and is still considered a major influence on many artists today. We can even speak of a revival through artists as Boys Noize and our own Rave Our Souls. The psychedelic properties of those squelchy acid lines will most probably change our DNA one day! But meanwhile let’s enjoy and absorb the old-skool acid sounds of Retro Acid. All 303 heads unite! Our first guest is the biggest lady the acid scene has ever known with Miss Djax from Djax-Up-Beats and related labels. For more than 20 years she has been at the forefront of dance music. She was the first to bring important acid producers and releases from the States to Europe and continues to also support local talent on her various labels. She’s received many awards for best dj. and best label as well as a gold award for 1.3 million records sold in 20 years of Djax. Need we say anymore … Lately she has been producing a lot of hardtechno but she still has a warm heart for acid and for this edition, she will bring an exclusive acid live-set, spanning 20 years of Djax. Our second guest is definitely a hero to acid fans. A quote from Discogs says it all: “..Leo Anibaldi is one of the few real talented and gifted producers in the electronic scene … Not only Mister Anibaldi really knows how to use his analogue gear, he’s also able to create a unique sound or universe with it, a twisted, bizarre and even holocaustic atmosphere. The man switches easily from techno & acid, whether it’s hard or just weird, to dark, capturing and claustrophobic ambient or illbient …” After having released on ACV and Rephlex during the ‘90’s, he is now running Cannibald Records on which he has released no less than 22 EP’s and mixes. In 2009 Cannibald brought a ‘Classics’ compilation with 15 re-mastered tracks of the man himself. In 2010 there was a mix compilation from his hand and next to many other talents from Italy, you can also find a new track of his on Cannibald, n° 22 which is just out now! We are very happy to welcome this true Italian acid legend o Retro Acid. More live work will come from Mr Gasmask, a true underground acid figure from Belgium who’s been supporting the genre with his Binary Bassline label. We have welcomed him on Retro Acid before with his label partner Arkanoïd but this time he will do the honors solo and he is guaranteed to rip the acid trough the roof. Other Belgian talent comes from Black Francis who played on the first 3 Kozzmozz parties ever ! He is a true techno and acid pioneer of the first hour. You all know what to expect, hard acid, brought to you in his own, unique way. The line-up is completed with our resident Spacid, who was at the forefront of the underground party-scene in the 90’s through his Funky Green Aliens organization and has been pushing the early acid sound in Belgium since the very beginning. He will be opening this edition and slowly build up the atmosphere with old acid house and acid techno so you better don’t be late.